Will Geiger is the College & Career Manager at Story2 and a veteran of the college admissions process who has read thousands of applications and successfully counseled hundreds of students through the admissions process. Previously, Will was the Associate Director of College Counseling at an independent school in Connecticut and a Senior Assistant Director of Admissions at Kenyon College. Will is a graduate of Wake Forest University and the University of Pennsylvania. I looked across the dining hall and saw a wide range of emotions on students’ faces. One boy had a notebook and pencil ready to go, another girl had a look of dread on her face, and many others were just sitting in place looking blankly ahead. This was our annual school assembly where the juniors would listen to a presentation from us--the college counseling team--about the admissions process. Admissions brings about a variety of emotions in students, as well as parents. Throughout the process, the biggest concerns are usually around the questions of “Where will I get in?” and “How will I pay for it?” These are certainly important aspects of the admissions process, but by focusing exclusively on them, students miss out on an important opportunity for personal development and growth. In our new course, College Admissions: What to Do Right Now, we aim help you build a meaningful and enriching future for yourself. The next year and a half are more than just submitting applications and getting some decisions; they are also about your transition into adulthood. One of the worst things about admissions is that there are so many moving parts and it can seem like you can’t get ahead. Essays, test scores, extracurriculars, Early Decision, Regular Decision, paying for college...the list goes on. In College Admissions: What to Do Right Now, we focus on making all of this manageable by breaking everything into actionable chunks. As Tony Robbins says: “Most people have no idea of the giant capacity we can immediately command when we focus all of our resources on mastering a single area of our lives.” College admissions is no different. Focusing on each step, one at a time, will allow you to achieve even more success. Having worked with hundreds of students in the admissions process I can say that the next year will sometimes be stressful and can even feel lonely. However, you are not in this by yourself. Your teachers, coaches, counselors, parents, and siblings are all there to help you. If you don’t understand something, ask. If you are feeling stressed out about something, reach out to someone you trust. In the next twelve months, we will also be talking about strategies to help you have important conversations and make this process a true partnership between you, your parents, and your teachers/counselors. Click here to sign up to be notified as soon as these strategies become available. Last but not least, it all works out. If you go through this course throughout the next year, work hard, and continue to fulfill your responsibilities, all of it will work out. I can’t promise any specific outcome or predict the future, but I can guarantee that there are multiple colleges that could be really great fits for you. Whenever you are feeling stress, just imagine yourself starting your first year of college, making friends, taking challenging classes, and building a meaningful life. We are excited to be on this journey with you. 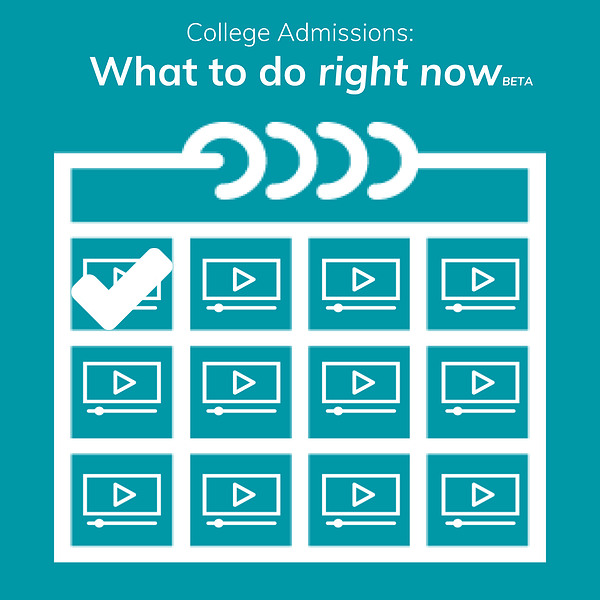 Click here to claim your spot in our new course College Admissions: What to Do Right Now. It’s free!